As I've been mentioning in recent posts, my good friends were visiting from Chicago last month. 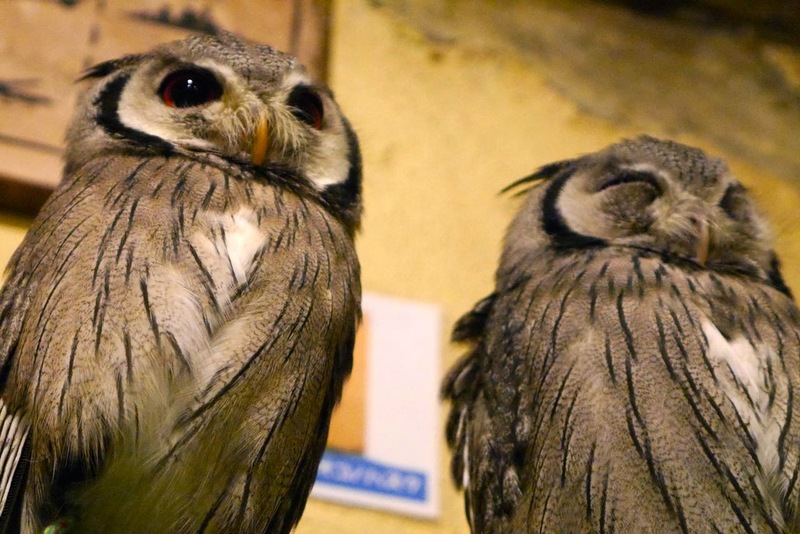 These two folks happen to really love owls, and so needless to say they were really interested in going to see them up-close-and-personal at one of Tokyo's many bird cafes. We chose the Tori no Iru Cafe (鳥のいるカフェ) in Asakusa (浅草) since we had spotted it while strolling around the previous day. In order describe the experience, I feel like I need to break the whole experience into parts. Getting right to the point-- OWLS! Yeah, going to see owls up-close and being able to handle them is a pretty amazing experience! 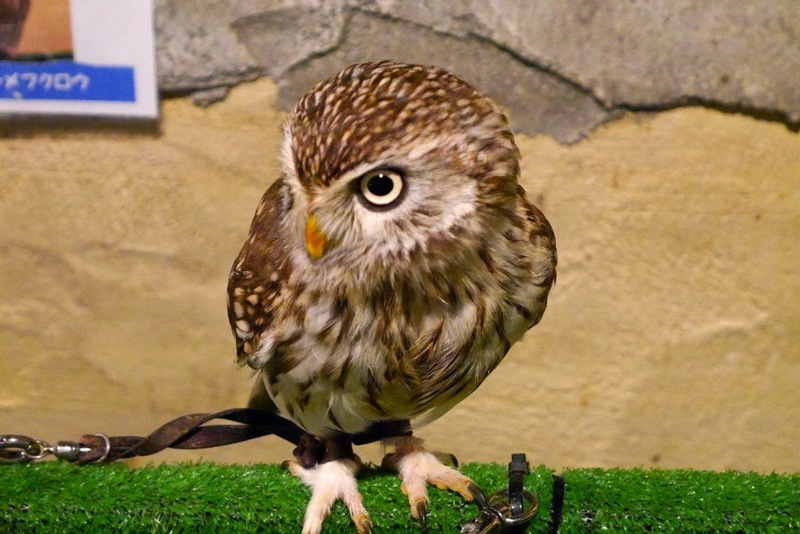 At a bird cafe, customers can pet, pick up and fully interact with owls! First off, they are adorable! Their big eyes and round bodies give them the impression of having come straight out of a fairy tale. I was really surprised by how soft and fluffy they are, and also by how accurately their feather patterns and colorations mimic the surrounding scenery of their native habitats. Something else I didn't expect is how calm and tame they were. 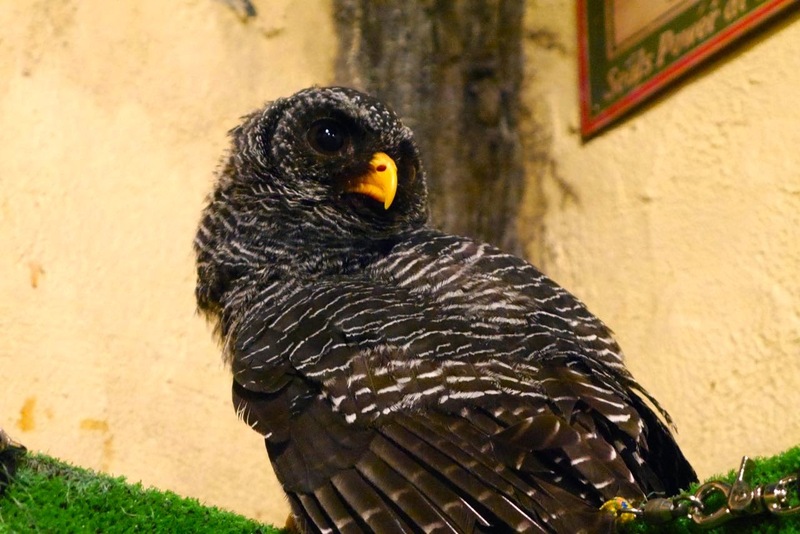 I know they have certainly been trained by their handlers to live in the cafe and to be handled by customers, but being birds of prey I never thought they would be so interactive with humans. My friend Valery was especially good with them. One of the owls totally fell in love with her and was extremely overjoyed to let her pet him for quite a long time! Check this out! Thanks to Valery Shuman for sending this precious video! On the flip-side, the owls can, at times, be intimidating as well. 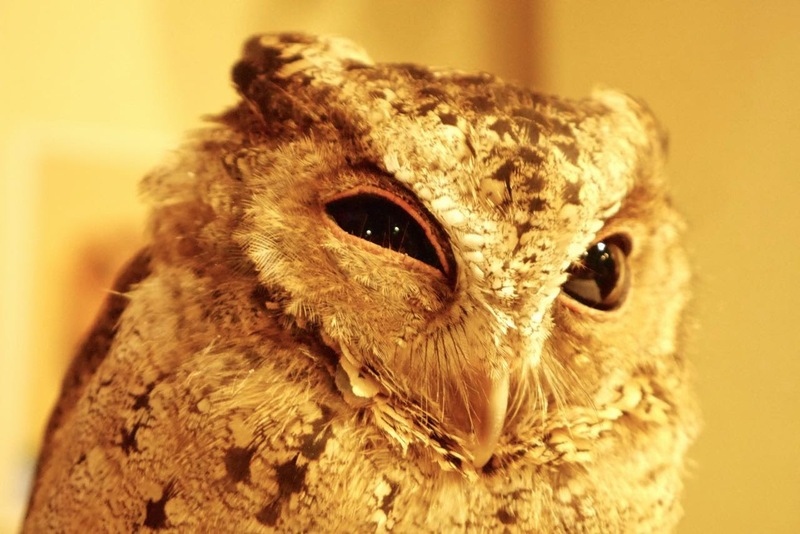 I say this primarily because many of them are very large, and knowing that owls have astoundingly strong jaws, and could certainly break a human finger if provoked is enough to make customers feel a little bit wary of them when they appear to giving signals that they would rather we not touch them. None of the owls there were at all aggressive, though, so in the end it may have been my own apprehension that made me cautious. 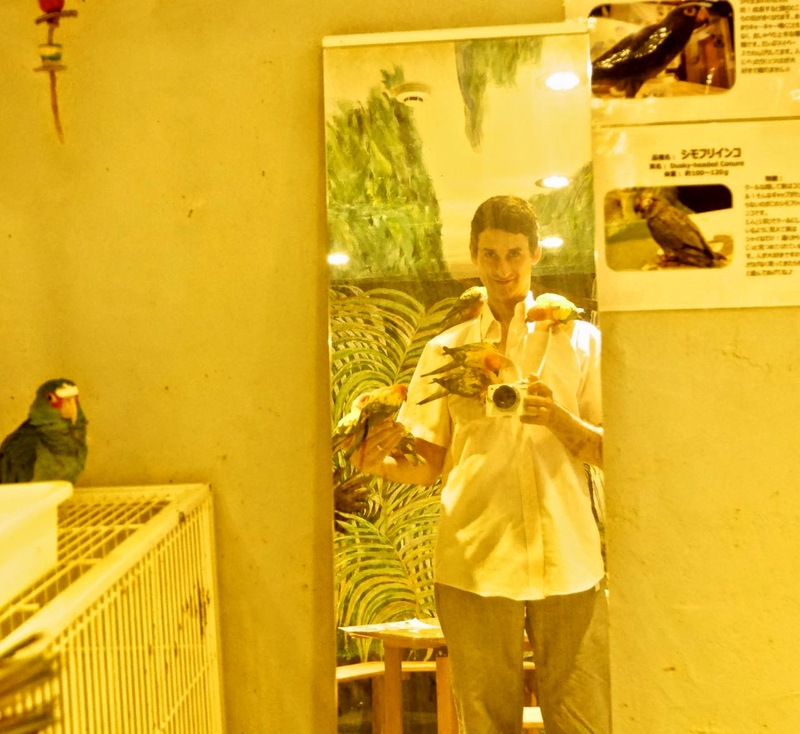 Aside from the owls, there is another room in the cafe with many species of smaller birds, especially conures. There are also cockatiels, love birds and other species of parrots and beautiful rare and exotic birds with which I'm less familiar. I think it would be good for customers to know what they're in for before entering this room! It was fun at first, but to be honest, it quickly became a little bit overwhelming. The birds in that room are extremely friendly and very curious. Since they have free reign in that room and are eager to meet guests, visitors will find themselves literally covered in birds within minutes! I did have fun with this for a little while, but then I realized that for each bird you put back on its perch, two more take its place. I had to work swiftly to make myself bird-free and quickly make my way out of the room. It's not that I wouldn't go in again, but it's best in shorter time spans I think. Moving on to other aspects of the experience-- the cafe. I have to admit that the cafe itself was not necessarily bad, but was not exactly what I expected. The interior is very small and although it's called a cafe, there are almost no places to sit and it would be almost impossible to enjoy refreshments of any kind. 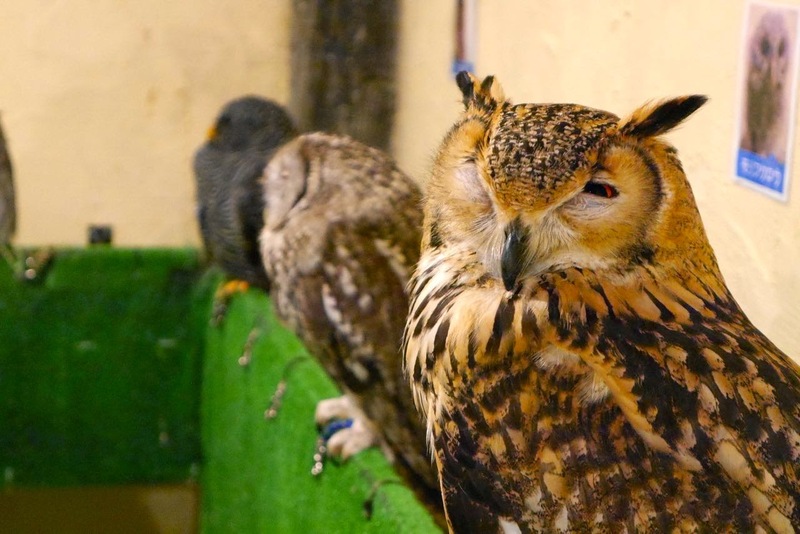 When the place is at full capacity, it feels extremely crowded and it's a little difficult to get close to the owls. 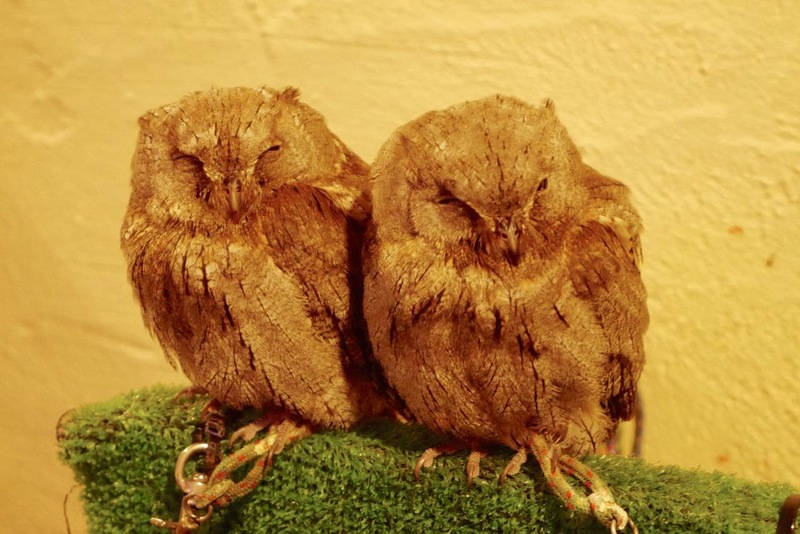 They're definitely the main attraction and the owl room has an extremely small capacity. Going to Tori no Iru Cafe also differed a bit from my visit to Cat Cafe JaLaLa in that the staff was very hands-off and a little bit on the inattentive side. All in all, the experience was pretty awesome and has made me interested in visiting other bird cafes. I somehow get the feeling, however, that I most likely wouldn't pick Tori no Iru Cafe as my first choice of places. Don't get me wrong, the owls were totally kool and made for a very fun time! Probably the best part of my visit was seeing my friends get this unique chance to interact with these beautiful birds. There are still a few more photos to be seen. Interested readers can follow this link to see more!